Kimberly McCullough is the Policy Director at the American Civil Liberties Union of Oregon. The ACLU of Oregon aims to defend and preserve civil rights and liberties related to a broad range of issues, including criminal justice reform, disability rights, free speech, LGBTQ rights, privacy & surveillance, racial justice, student rights, reproductive freedom, prisoner’s rights, police accountability, and more. Kimberly works to advance these goals through engagement with the state legislature, public agencies and local governing bodies across the state. 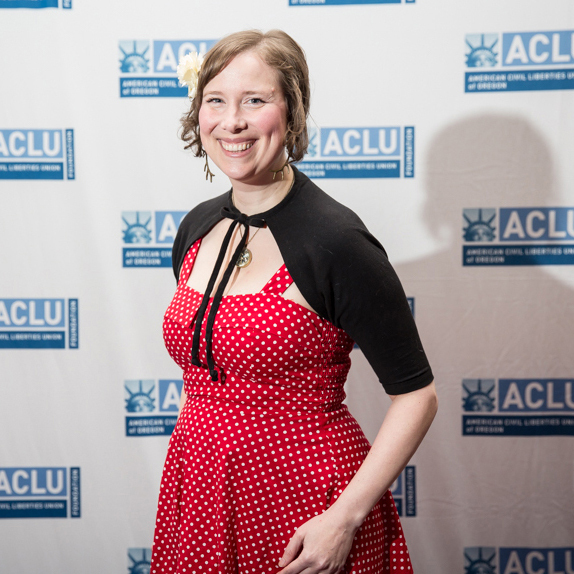 Before joining the ACLU of Oregon staff, Kimberly worked in private practice as a litigation attorney. She obtained her law degree from Lewis & Clark Law School and a degree in Creative Writing from the University of Washington. Kimberly’s favorite free time activities are dancing, crafting, and smiling. She is particularly fond of alpacas, robots, and all manner of things that are cute.